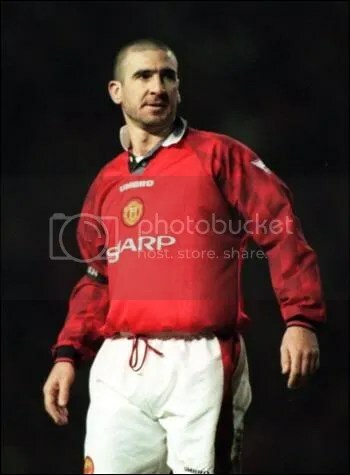 Manchester United legend ‘King’ Eric Cantona spoke of a move back to England with French media source, La Provence, stating that a move back to United or toward the England National team in the shape of a coach or manager would arouse his interest severely. With Capello and Ferguson not showing any signs of leaving their posts, Eric is waiting in the wings for a possible opportunity for a loose ball to smash into the net as he did so many times in the red of United. If I am to return one day, it will be as a coach and because I could bring something new. But it will be in England, with the national team or at Manchester. Whatever about the England, who knows what goes through the FA’s mind. One would think they pick a name out of the hat almost for their next manager, United is a different story. A legend at the club and loved by all the fans, Eric would be accepted back I feel but his inexperience would hinder him greatly as a manager. I envisage him returning as a coach when Giggsy calls it time and goes into the coaching role. The managerial post will have some god bets when Fergie does relinquish his throne with Jose Mourinho, Steve Bruce, Martin O’Neill, David Moyes, Mark Hughes, Ole Gunnar Solskjaer, Roy Keane, Darren Ferguson and now Eric Cantona all added to the shortlist of managers with a chance of getting in on the action. A coaching role is very much on the cards when Sir Alex mentioned a few months back about giving retired players a chance at becoming a coach at the club, indicating Ole Gunnar Solskjaer’s success as Reserve team manager in his first season. This entry was posted on May 18, 2009 at 5:23 pm	and is filed under General News. Tagged: David Moyes, England, Eric Cantona, Jose Mourinho, Martin O'Neill, Ole Gunnar Solskjaer, Sir Alex Ferguson. You can follow any responses to this entry through the RSS 2.0 feed. You can leave a response, or trackback from your own site.